We visited the seaside at Hythe in Kent, one of the five Cinque ports, on Saturday. Hythe is a pleasant little market town, although nothing like as pretty as Rye or Winchelsea. The highlight of Hythe for medievalists is found beneath St Leonard’s Church. The church itself is an enormous edifice up on the hill, largely built in the fourteenth century, with features going back to the eleventh century. That is all quite typical of an old Kentish church, and luckily St Leonard’s has been left relatively unscathed by the dreaded Victorian Church Restorers. Under the chancel, there is a long-forgotten chamber that holds a remarkable collection of medieval bones. 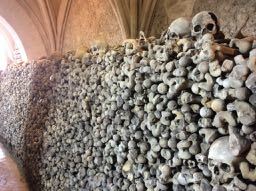 Over a thousand skulls are neatly arrayed in racks and there is a huge neat stack of bones. Local legend claims that these are victims of the Battle of Hastings, but analysis has revealed the majority are women, and there are few wounds in evidence. The crypt’s attendant had a much more prosaic explanation for where the bones came from: when the chancel was built in the fourteenth century, much of the churchyard was dug up. The bones of parishioners found during the building work were stored in the cellar of the church and forgotten about for centuries. The earliest references to the ossuary date from the seventeenth century and the current layout, with its neat stack of bones, was assembled in 1910. The collection has recently yielded interesting information on the health of medieval people, which wasn’t great. The crypt is not as spooky as an old room housing thousands of human bones might be. 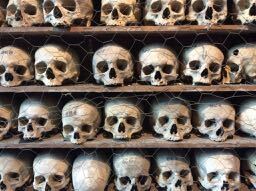 There are large windows providing plenty of natural light and the skulls seem content to mind their own business as we tourists passed through. But I found that if I stopped to examine the bones more closely they ceased to be gothic decor and became the remains of individuals. Once, these grey and decaying relics were people who were in the centre of their own universes, just like I am in mine. The owners of some of these skulls knew and maybe loved the owners of others. Now every one of them is anonymous and unknown. The dead are democrats as they all now count for the same. While ossuaries are not uncommon on the Continent, there is nothing else quite like the St Leonard’s crypt in England. It is generally open over the summer and well worth a visit. behold the skulls of those of earlier and late times. Who is the evildoer, who is the benefactor?" The Dialogue of Pessimism- ca. 1,000 B.C.